How good would a bowl of bamee, the ubiquitous and simple Chinese-style egg noodles, have to be in order to justify a wait of ten, twenty, or even thirty minutes? 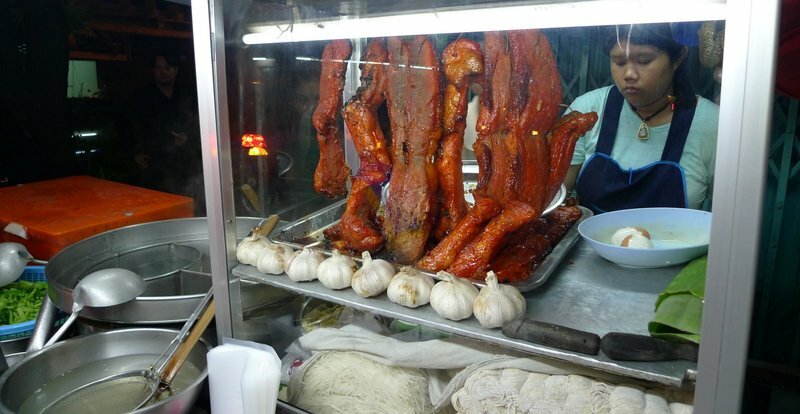 For many residents of Bangkok, they would have to be as good as Uncle’s. 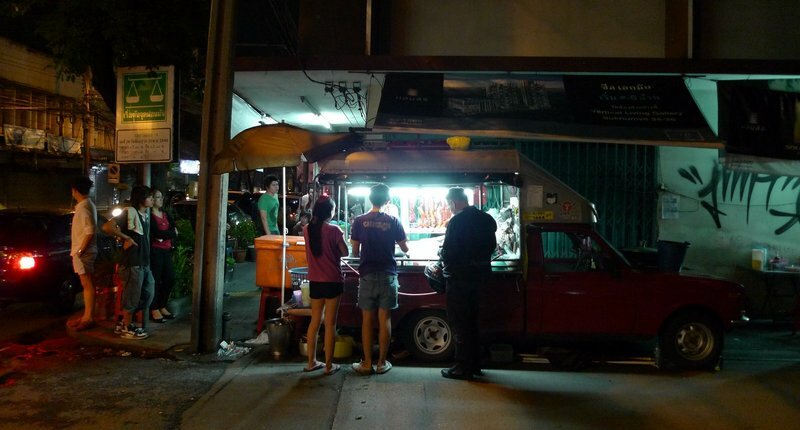 While practically everybody knows about this noodle shop, I only learned about it by reading Chawadee Nualkhair’s “Bangkok’s Top 50 Street Food Stalls,” a handy and well-written English language guide for anyone who is serious about eating good Thai street food. 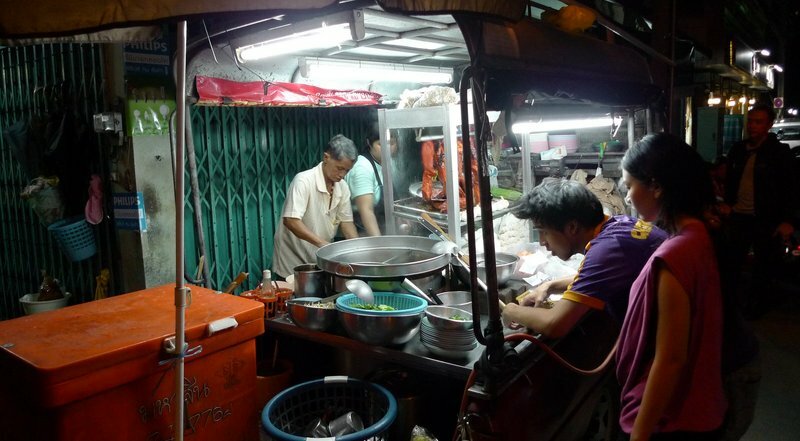 You can find Uncle’s noodles (the stand also goes by the name “slow noodles” because of the wait) at the corner of Ekamai and Ekamai Soi 19. His cart is built on the back of a small pickup truck, a nifty arrangement that reminds me of the food trucks of Los Angeles, except with no Korean tacos. You have to place your order by writing on a pad – in Thai, of course. Best to have a friend come with you, write out your order in advance, or as Khun Chawadee suggests, if you are brave you can just copy the previous customer’s order! The menu is quite simple: bamee (egg noodles) served either in soup or dry, with barbecue pork (“red pork”) and pork wontons. The ingredients are on display: your guarantee of freshness. Say, what are those black things in the display case? Nothing like a few phallic good luck charms to ensure good business. It seems that they’ve worked! All of the seating is on the sidewalk, either on the Ekamai side or heading down the side soi. Orders to go are welcome, too. I’ll say that the location is a bit of a curse from an enjoyment perspective. There are a lot of big trucks traveling on Ekamai at night and the smoke and fumes take away from the experience. The stand doesn’t open up until after 8:00 each night, so at least the gridlock of cars isn’t there anymore. That might be worse. 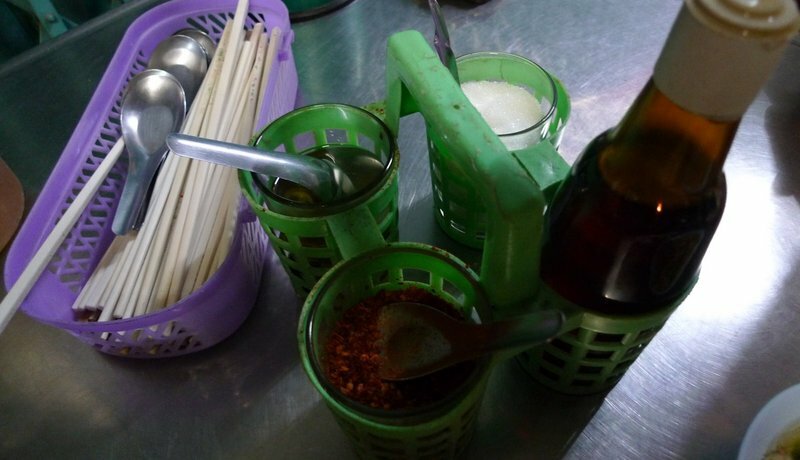 Every noodle shop in Thailand – and I do mean every – offers customers condiments to dress their own noodles. Dried chili flakes, sugar, vinegar with chilies, and fish sauce (sometimes with chopped chilies). This allows each customer to perfect the seasoning. Here’s my bowl of bamee with barbecued pork, chopped pork, fried pork fat, and a special ingredient: soft boiled egg. Pork-a-palooza! If you order the red pork at a rice and red pork stand, boiled egg is a standard condiment. 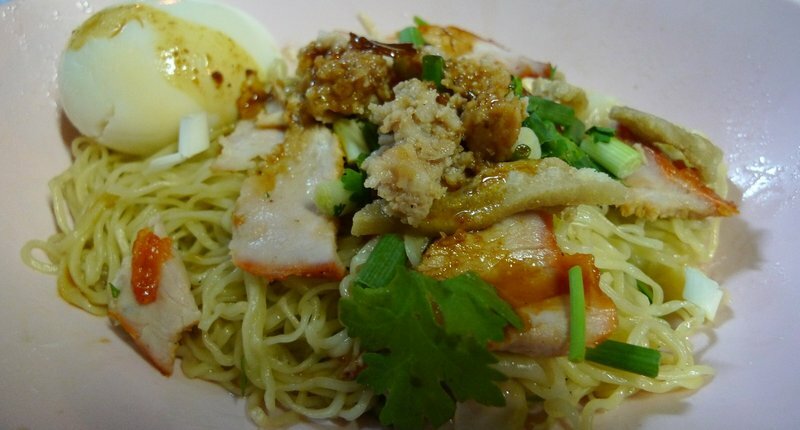 However, at a noodle stand, the soft boiled egg is an unusual addition. The question is, what makes this particular bamee so special? As I mentioned, people will wait up to thirty minutes to eat it and, honestly, at a certain level I think that bamee is bamee is bamee. But, there are a few things that separate good from mediocre bamee: Noodles are fresh, tender, and flavorful. Broth has a rich flavor. Ingredients are of high quality and are fresh. Uncle’s noodles has all of these qualities. The addition of crispy fried pork fat adds a little extra texture that is very flavorful, and the boiled egg is a nice addition, too. We also ordered a bowl of wonton soup, which featured beautiful fresh wontons with a tasty interior along with some more of the red pork and chopped pork. Something that set the wontons apart is that the wrappers were especially delicate and thin, not chewy at all. All in all, Uncle’s noodles are well worth searching out, although the location makes for a less than ideal dining experience. This entry was posted in Uncategorized and tagged Bamee, Bami, Bangkok, Cha shu, Dining, Egg, food, Krungthep, noodles, Pork, Red Pork, street, Thailand, vendor, wonton by christao408. Bookmark the permalink. @christao408 – exactly. that’s why I said I prefer. Looks real good ! Even though I would think it would be a bit scary to eat food in places like this. Obviously they make sure its fresh. 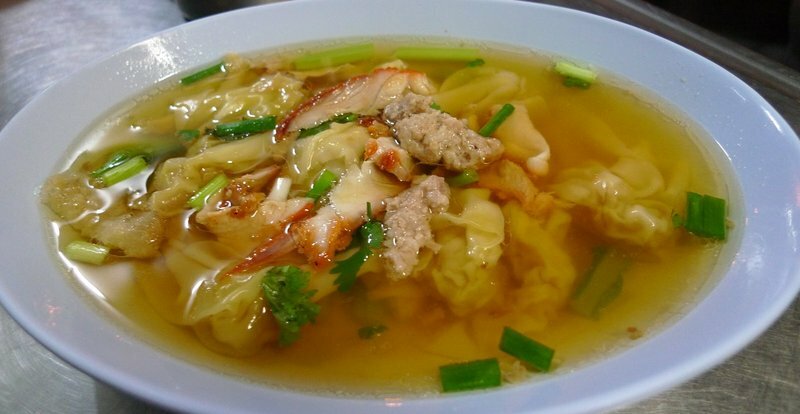 omg – I love egg noodles and wontons. I like the noodles to have a bit of bite in it – kinda like al-dente. You can almost hear the gentle crunch as you bite into it. I think some cooks give it a quick dousing in cold water and then bring the noodles back to a boil again to finish cooking. Rumour has it that this helps improve the texture of the noodles. After years of reading your blog and picking up decorating tips, I think I’ll choose the one in this entry. Those black phallic things would look good in my condo and bring me some much needed fortune. Does size matter? p.s. where is Andy? I guess what makes a bowl of good noodles are the ingredients. Your bowl of bamee has that soft boiled egg, which is quite a bonus! By the way, I came across a good noodle place in Thai Town (with the majority of the customers consisting of Thai people), that’s usually a good sign, I suppose. The owner is a good ol’ Thai lady, very friendly and hospitable. @ElusiveWords – Matt, you’re right about the dousing! I did that sometimes too. Add this to our list on our next visit…. So tomorrow, i should head to Ekamai. ;P have heard of the place but where? any BTS nearby? I agree, the location would be most unpleasant for me too. I have tried eating authentic foods like this in India, and the fumes from the trucks, the noise and smoke etc, really made me sick. @I_love_Burma – Soi Ekamai 19 is at the far end of the street, closer to Petchaburi than Sukhumvit. You can go to the Ekamai BTS station and catch a motorbike or taxi from there. Remember, uncle doesn’t open until after 8-8:30 pm. @ZSA_MD – Agreed – fresh air makes food taste better. Al fresco is not the same as al fume. @Redlegsix – @The_Eyes_Of_A_Painter – Generally speaking, the street food is quite safe and delicious. A place that is serving unclean food is going to go out of business mighty fast! 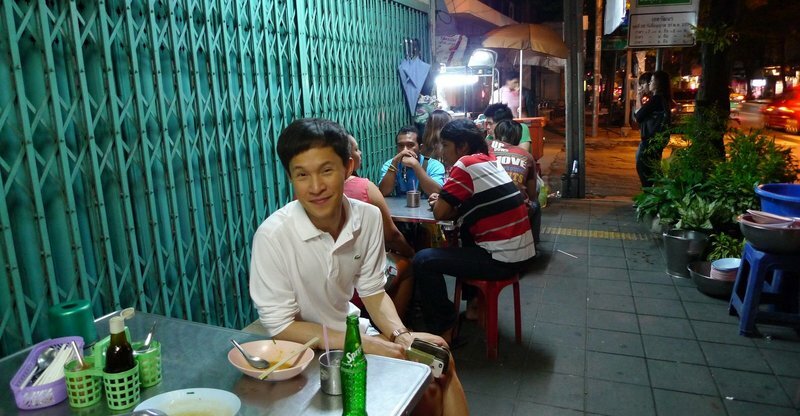 @jandsschultz – Honestly, there are other street food places I would take you to, first. This is good but sitting next to the busy street isn’t so nice. @ElusiveWords – I would expect that you have a few of those good luck charms already, no? As for Andy, I haven’t spoken with him in a few weeks and am not sure what he’s up to. I should check. @CurryPuffy – Oh, let’s go there next time I’m in LA! In this case I am willing to sacrifice location for the soup!! mm… looks delicious! i was craving noodles, so i cooked up a bunch of chow mein tonight for dinner. i miss the really good noodles, though, that my parents used to get from the local noodle factory in town. i also grew up eating (and making) won ton using the really thin wrappers (it was called hong-kong style, not really sure why), so i like it way better than the thicker stuff. hmm… i should make won ton! @Sinful_Sundae – @yang1815 – Wonderfully simple fod. @kunhuo42 – yes, you should make won ton, take pictures, and post about it! =D@AzureRecollections – Taking it home would be a fantastic idea, I think. @Fatcat723 – The sacrafice we made, too.